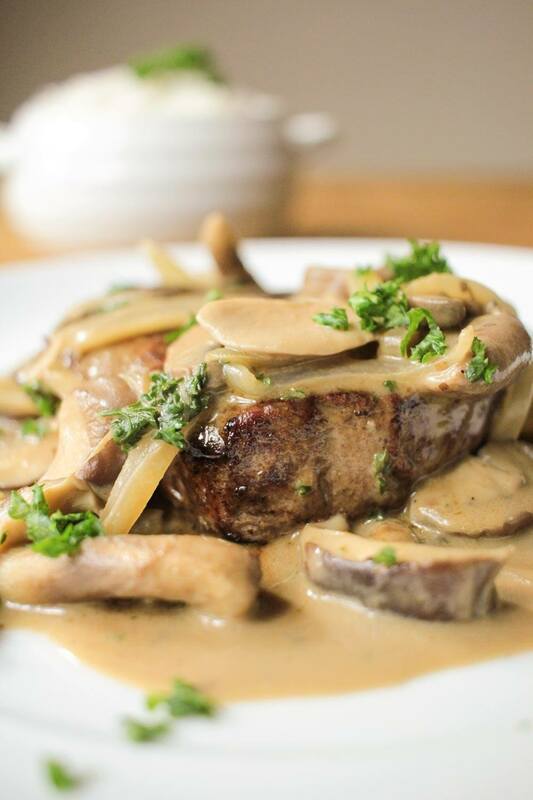 Here's a twist on the iconic beef stroganoff and a delicious way to enjoy a big juicy fillet steak! Take your fillet steak out of the fridge so that it comes up to room temperature. Season each steak with salt and pepper. Put your rice on, follow the instructions on the packet for how long to cook it. Heat the butter in a large frying pan on a medium heat, add the onions and cook them for about 5 minutes until they are nice and soft. Add all the mushrooms and cook until they are soft, stirring in with the onions. Add the mustard and stir in well so it's coating the onions and mushrooms. Turn the heat down, then add the flour and stir in well. Once the flour has coated the onions and mushrooms add the beef stock, then keep stirring. Turn the heat back up and let it come to the boil. Turn down to a simmer. Add the crème fraîche to your sauce and stir in. Leave to simmer while you are preparing your steak. Note that if you like lots of sauce then don't over simmer it. Put a large frying pan on a full heat. When it's smoking hot add the steaks and brown on each side for about 2 minutes. Depending on how you like your steak cooked you might want to do this for a bit longer. If you want to flambé your steak then put the brandy into a ladle and carefully heat over a flame. When the alcohol starts to burn off you will begin to see fumes. Tip it very gently towards the flame and it will ignite. Immediately and carefully pour the brandy over the steaks, stand well back and allow the flames to die down. Add 1 tbsp of butter to the pan and baste the steak as it melts. Rest your steaks for a few minutes. Check your sauce, season with salt and pepper then sprinkle with fresh parsley. Plate your steak up and spoon over your sauce. Enjoy with some steamed rice.